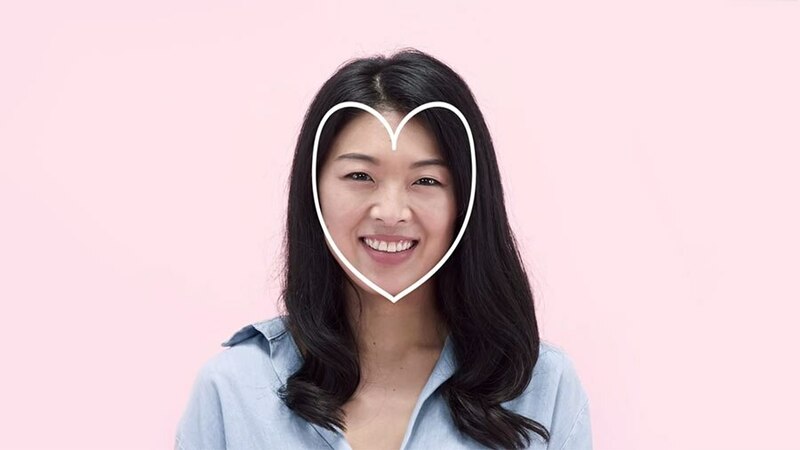 Finding the right pair of eyeglasses for your heart shape face may feel daunting, but EyeBuyDirect has the scoop on how to find a frame in a heartbeat! Whether you're looking for men's or women's eyeglasses, the best glasses for heart shape faces are rectangle, oval or wayfarer. Heart shaped faces feature curved lines and elegant angles. Not sure if you have a heart shaped face? To figure out if you have a heart shaped face, stand in front of a mirror and use your fingers to trace the outline of your face. Heart shape faces are widest at the forehead, have high cheekbones, and taper down to a narrow chin. As we mentioned before, this face type has a mixture of curves, angles, and lines. That means some faces are rounder and more heart shaped, while others are more linear and angular, like an upside down triangle. Whether you're one or the other (or a little bit of both! ), we've got the right eyeglasses for heart shaped faces. Oval glasses fit heart shape faces perfectly. They help soften and balance out the angles of faces so they better resemble a base-up triangle face. Since they’re not as tall as round eyeglasses, they also don’t risk overemphasizing your cheekbones. Wayfarer eyeglass frames are good for people with heart shape faces because they tend to be wider at the top than at the bottom. This tapered lens shape helps add width to the top of your face without drawing too much attention to your cheeks, giving your face a balanced look. If you're looking for frames with a taller lens height, rimless and semi-rimless eyeglasses are good for base-up-triangle faces. The lack of frame elements keeps your look light without highlighting your stronger facial features. Rectangular glasses balance out the curves of your heart shape face without drawing too much attention to its width. Wear thin metal frames and light colored eyeglasses to help to keep your look from becoming too topheavy. When shopping for eyeglasses for your heart shaped face, it's wise to avoid oversized frames or frames with a lot of design elements. Since your cheeks are already quite defined, oversized glasses will make your face appear even wider. Frames with a lot of designs elements, especially in the lower portion of the frame, will draw attention to your cheekbones. The soft curves of oval-shaped eyeglass frames compliment heart shape faces while maintaining a nice, feminine touch. Men with heart shape faces may want to go with styles that are more traditionally masculine. The strong angles of EyeBuyDirect's metal frames help to balance out the curves of a heart shape face while adding a masculine touch. If you're looking to smarten up your work attire, dark-colored frames with thin lines are perfect for professional or formal settings. So what's it going to be? Some stylish, new rimless eyeglasses? Or maybe you're on the lookout for something a little more geek chic, like a pair of retro-inspired wayfarers. Before you buy, you're going to want to make sure that the glasses get are the right fit. Make sure to check out our measurement guide if you're not sure where you should start. With over 1000 styles, you'll probably want to see what your new glasses will look like before you buy – it's only natural. And you can try on that pair of wayfarers before buying, just use EBD's EyeTry feature. It's your digital dressing room that'll let you try on any pair of EyeBuyDirect glasses before you purchase. Whether you're browsing our catalog or have zeroed in on a specific pair, all you have to do is click "Try On" to upload your picture and see what your selection will look like on your face.